Beautiful handmade personalised favour box in a sage green design. 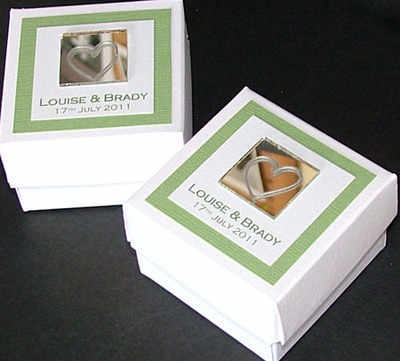 Your names and date of wedding is printed underneath the mirrored heart design on the lid of the box. SIZE OF BOX: 5x5x3 cm. If you would like filled boxes here are some suggestions of our products that would fit nicely into these boxes. Please order the products you would like from our shop in your chosen design. If you are purchasing favour boxes and chocolates/love hearts together we can fill the boxes with your choice of products before sending out your order if you would like us to. Please e-mail us on info@itsawrapcornwall.co.uk if you have any queries.